The Islamists who control much of southern Somalia have warned they will fight any peacekeepers sent there, after the UN approved a peace force. 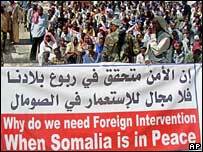 "We see this as creating instability in Somalia. 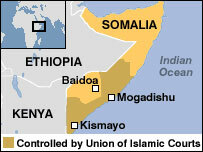 Most of Somalia is peaceful," Union of Islamic Courts official Ibrahim Adow told the BBC. The UN resolution backs the sending of an 8,000-strong African force to support Somalia's weak government. It also called for the easing of an arms ban to let the government re-arm. "Deploying foreign forces to Somalia is seen as invading forces and the Somali people are prepared to defend themselves against aggression," Mr Adow told the BBC's Network Africa programme. The US-led resolution, adopted unanimously by the 15-nation Security Council, said Somalia's transitional government represented "the only route to achieving peace and stability" in the country, which has been without effective central government since 1991. But Mr Adow said supporting the government, which only controls the area around the town of Baidoa, would create more trouble and complications in Somalia. The East African body, Igad, which is supposed to supply the troops is understood to be split over the idea. Somalia's government has welcomed the resolution. "We thank all the members of the Security Council, especially the American government," Deputy Defence Minister Salad Ali Jelle told Reuters news agency. "This will bring solutions not war." The government and the Union of Islamic Courts are due to hold peace talks in Sudan next week. They have organised several demonstrations against foreign forces being deployed. 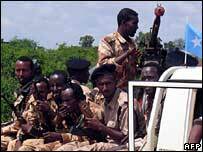 They see a peacekeeping force as cover for Ethiopian troops being sent to help the government, even though the UN resolution rules out troops from countries which border Somalia, such as Ethiopia. Why does the UN want to go in now that the Islamists have done a better job than the UN would ever have done. A recent UN report accused several countries, including Ethiopia and Eritrea, of breaking the international arms embargo. The Islamists have removed the check-points, at which gunmen used to extort money from commercial vehicles since taking control of the capital, Mogadishu, in June. They have also banned the popular stimulant, khat, used by many Somali gunmen.